The Jay-Be® Revolution Folding Bed with Airflow Fibre Mattress offers comfort and durability with space-saving convenience. The patent pending design makes the Revolution more compact, sturdy and comfortable than traditional folding beds. For optimum comfort and full body support, the Revolution Folding Bed has a breathable mattress which rests on the unique Jay-Be® J-Tex® sprung base system making it suitable for regular use. J-Tex® is made from PVC coated woven polyester, a specially engineered technical fabric designed to be stretch resistant and offer long term durability. Suspended using hightension springs, the J-Tex® sprung base system is extremely strong and independently tested and proven to perform as well as regular permanent beds. 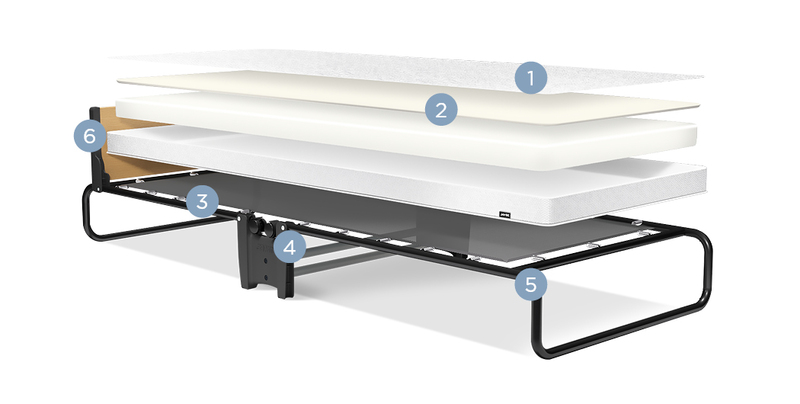 For easy manoeuvrability, 360° castors allow you to simply glide this guest bed to where you need it, when you need it. It also comes with a headboard to stop your pillows escaping while you sleep. All Jay-Be® folding beds are made in the UK and come with a FREE lifetime frame guarantee for your complete quality assurance. The Revolution Memory Foam folding bed is a robust guest bed with a headboard. Its breathable Airflow Fibre mattress is topped with a layer of Memory Foam for a premium feel. - Standard on all models from September 2018.